Scott Benson and Len Kaminski are scripting together again. Cold Warrior has sort-of been invented for this issue. There have been 2 previous uses of the name but most authorities agree that all 3 are separate characters. Marvel Premier #35-37 featured a 1950's Cold War hero called 3-D Man and in #37 an American scientist Cold Warrior was tricked into attacking him thinking *he* was a Communist. What If? #9 showed us a short-lived 1950's group called the Avengers which included 3-D Man which fought a team of old enemies including Cold Warrior. It was unclear whether this was the past of Earth-616 or not, until Avengers Forever declares it an alternate timeline. So that's a different 3-D Man and Cold Warrior. However the 3-D Man of MPr#35-37 later surfaced in Earth-616 comics, so *his* Cold Warrior is in the main timeline, but he was American not Russian. And all 3 Cold Warriors have not made repeat apps. 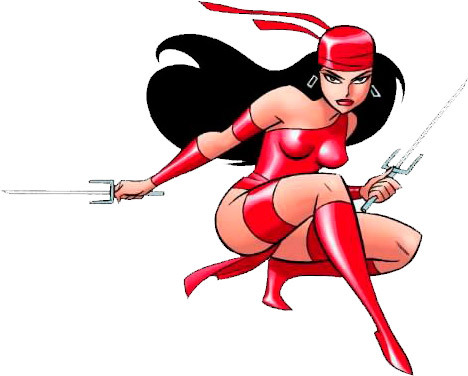 Hawkeye left the West Coast Avengers after his wife Mockingbird died in AWC #100 and after the Bloodties Avengers/X-Men crossover which included AWC#101, so he wasn't there for the breakup of the team in AWC#102 and the formation of Force Works. Since then he's had his 2nd mini-series fighting a branch of the Secret Empire, which is where he made an ally of Mack Mendelson, and a 3-part tale within Marvel Comics Presents #159-161 where he was living rough in the wilderness. Iron Man didn't want to recruit him for Force Works but US Agent went looking for him anyway. The 2 old sparring partners settled their differences and reached a grudging respect for each other. Hawkeye isn't angry with Tony Stark for anything which happens in MCP#161. Instead that issue explains *why* he's fallen out with him. If Iron Man hadn't left the team then Mockingbird might not have died in AWC#100. And then he didn't even show up for her funeral (also #100). In our #11 Jim Rhodes will offer Mack Mendelson a permanent job of maintenance on his armour but Mack will turn it down and disappear into Marvel oblivion. Hawkeye will guest among others in the Giant-Man flip-sides of Avengers #381-382 before visiting Iron Man and Force Works in FW#8. War Machine will fight Vengeance in that char's story within MCP#167-169 and then asks for Tony Stark's help in IM#309 before confronting him as War Machine in our #8 and IM#310. 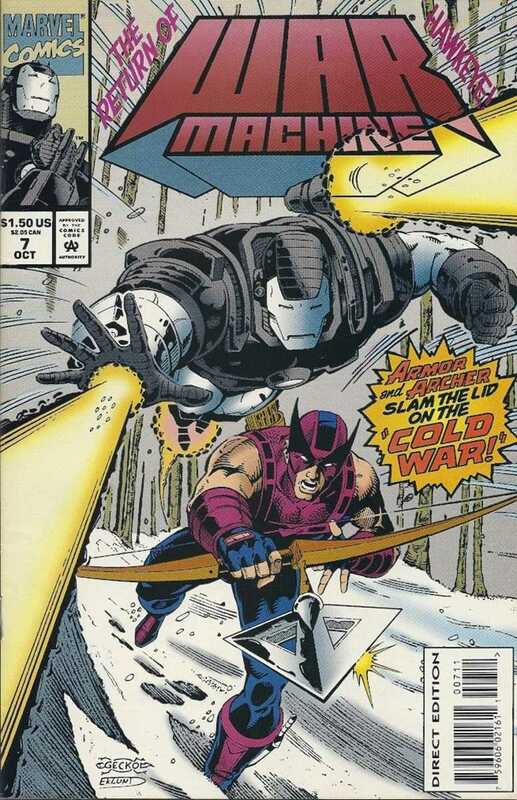 This issue starts near the end of the story with War Machine defeated by the Cold Warrior in the Arctic. Ex-Soviet Major Konstantin Cheratny, cryogenics expert Dr Giorgi Grotowski and tech-genius Mack Mendelson watch it from the otherwise-deserted People's Research Station 27. And they also see Hawkeye lying on the frozen ground as Cold Warrior boasts of having woken from a long sleep to see the Soviet Union triumphant over the Western Imperialists. 6 hours earlier War Machine arrives near here following Hawkeye's Avengers Communicard signal. And Hawkeye announces his presence with a thermite arrow to warm his friend up. Then Clint Barton takes James Rhodes into his shelter for a bowl of chilli to complete the job. Rhodey tells Clint how he's killed 2 people recently in Imaya (Eda Irul in #4) and Corteña (Deathtoll last issue) and it's eating him up. Then we get a flashback within a flashback to a Worldwatch meeting as Jim explains to Clint about being Director of Worldwatch, most of whom don't know he's War Machine. In the meeting Rebecca Bergier says WM's intervention in their affairs is putting the whole project at risk. Sheva Joseph, who *is* in on the secret ID, points out it was WM who got them the evidence they needed in Corteña, and tried to save their founder and inspiration Vincent Cetewayo in Imaya. Ranald Jeffries doesn't say anything, and neither does Rhodey because he didn't know who was right. He's now contemplating giving up being War Machine and giving the armour back to Tony Stark - it's beginning to fail anyway. Clint relates a story apparently from his early days as an Avenger. He frequented a local cop bar to learn what it was like to face bad guys on a regular basis. 1 cop had killed 3 men in his time, and bragged about it. Another was a rookie who had just killed his 1st. It was judged a lawful kill but he couldn't live with it and committed suicide. His point is that you have to avoid caring too much as well as becoming too callous. Rhodes changes the subject and asks Barton why he's here. Clint says he's looking for his friend Mack Mendelson (who Rhodey met in Hawkeye (1994) #3) who's disappeared. The only clue in his ransacked home was a tracker which he believes Mack left hidden where he would find it, and which has led him here. In PRS27 the kidnapped Mendelson is absorbed in fiddling with cryogenic machinery. Major Cheratny is sure that his intellectual curiosity will prevent him from sabotaging the job. Dr Grotowski isn't sure the process will work after such a long time. Outside Hawkeye is sneaking under the radar of the base which a hacked SHIELD database told him had been abandoned since the Berlin Wall fell. War Machine is flying in cloaked. But inside an alarm goes off because the stealth field is 1 of the parts of his armour that is failing. Mendelson is complaining about the crappy way the cryogenic system was built. Cheratny tells him he'd better fix it *now*. Mendelson says he fixed it ages ago, he was just spending time looking around for his own interest. Dr Grotowski switches it on and the sleeper awakens. Cheratny tells the Cold Warrior he's been asleep for 30 years but now is the time to fight. As our heroes approach the building Cold Warrior smashes his way out to greet them. War Machine's repulsors knock him back but Hawkeye's blast arrow fails to impress. Grotowski explains to Mendelson that the Warrior absorbs kinetic energy from his surroundings, hence the frozen air around him. So the attacks were just powering him up. And WM's thermocouple(?) fails so that the cold starts to get to him as CW grabs him. Hawkeye tries to intervene but is knocked down by the wall of frozen air. WM's armour signals imminent system failure. And that's where we came in. Now Hawkeye fires a thermite arrow at War Machine's back which gives him a power boost (I thought that was what the supposedly-failed thermocouple was for). WM blasts a big hole in the ice and Cold Warrior falls in, clinging to the edge. WM tells him that the Soviet Union is no more, but CW doesn't believe him. Cheratny tells Grotowski to deactivate CW's kinetic conversion weapon and help him out of the hole. But the man dies when they get him inside because switching off the weapon also switched off the life-support system that kept him alive. Rhodey is about to blame himself for another death but Clint stops him. He points out that dictator Irul, psycho-killer Deathtoll and blindly nationalistic Cold Warrior never questioned their actions. Such questioning will keep Jim honest. They'll start worrying when he stops doubting himself. Back in Clint's shelter Mack has a look at the War Machine armour. He's much more impressed by *this*. He says he can fix it but he needs the blueprints, so Jim will have to go ask Tony Stark for them. Rhodes is reluctant because he still hasn't forgiven Stark for letting him think Tony was dead (Iron Man #284-289). Clint says he's got a beef with Stark too (an editorial comment says see Marvel Comics Presents #161, but see my Comments). But then Rhodey says he'll do it. Plus: Cold Warrior, Mack Mendelson, Ranald Jeffries, Rebecca Bergier, Sheva Joseph, War Machine (James Rhodes).